Northern Prairie Alpacas, LLC: Blog: Where is that sign? 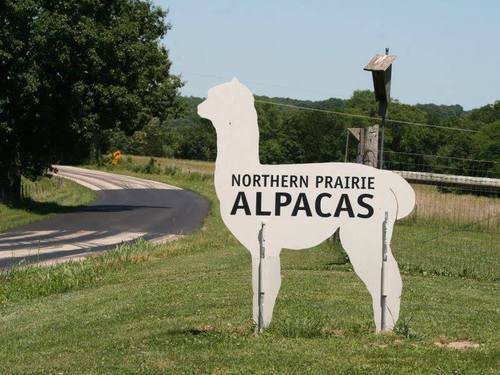 It has been a week since our alpaca silhouette sign left our property for parts unknown. Yes, it was just a sign that announced the name of our farm; the shape of the sign let passersby know what type of livestock lived on the farm. I really liked that sign and experienced an emotion or two upon discovering it was no longer standing guard by the edge of the road. It is amazing to me the good things that can come about in the aftermath of a bad experience. Photos of the missing sign were quickly posted on Facebook with the hope someone might see it and the sign might magically appear back where it belonged. While, of course, I realized that was more than a long shot it seemed worth it even for just the small chance. Here is where the magic of social media began working. I have been so very touched by the numerous good people who quickly responded by sharing my post to get it out to even more people. Many people who I know personally, a great many that I have never met but live in my area as well as people who live far away but wanted to help, took time out of their busy lives to share/comment/send me private messages, etc. It is a great thing to be reminded that there are far more good, kind, honest, caring, and generous people in our communities than there are the few who do not fit those categories. A huge virtual hug along with a big THANK YOU goes out to everyone who touched me over the last week. Perhaps I needed something . . . . . . . a ‘sign’ . . . . . . . to get me moving and motivated to do some things I have been putting off for far too long. One of the things that I have been procrastinating on is doing some re-branding for the farm. As with most businesses there have been some changes in direction and focus over the last few years so updates need to be made in the way the farm is presented to the public. Since a new sign for the roadside is in order we will wait on designing a sign while exploring a bit of a makeover for the farm logo. All of these steps take time as well as monetary investment so it may be a while before we get to the point of unveiling a new farm sign at the end of the driveway. Stay tuned as it will come and I will again use social media to announce the new sign whenever I manage to get to that point. In the meantime I can still hold a bit of hope that the alpaca silhouette might find the way home. Someone in New Mexico commented on my FB post that she had a farm sign that went missing and her sign appeared again several months later! Another friend mentioned that the sign would probably be a very unique wall decoration in someone’s dorm room this fall; this is probably the most likely place for the missing sign. 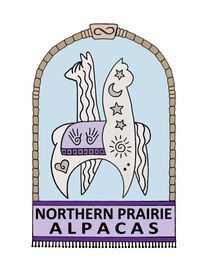 If that is the case I will be happy with that thought because that exposure for alpacas just might spark interest in alpaca livestock and/or the lovely products made from their fiber. It is always a good thing to heighten awareness of this wonderful fiber bearing livestock even in an unconventional way.